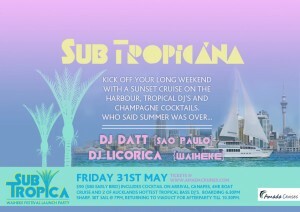 Kick of your long weekend with a cruise on the Auckland harbour, tropical DJ’s and champagne cocktails! We are celebrating the launch of a very special tropical music festival to be held on Waiheke Island January 26th – 28th, Auckland anniversary weekend 2014. Come and experience the uplifting sounds of Latin American dance music and get a taste of the SUBTROPICA fiesta! 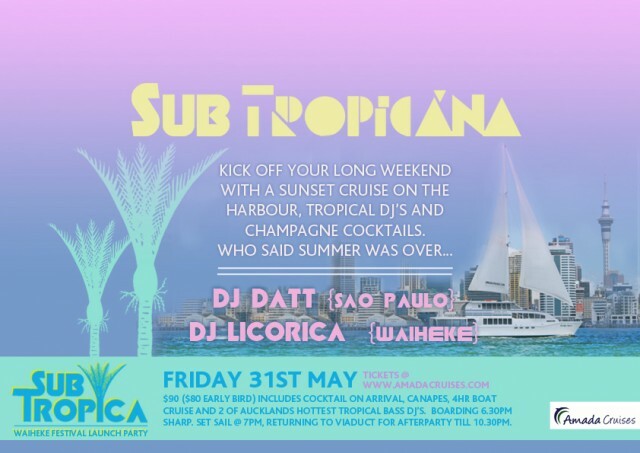 DJ’s on board from 6.30pm until 10.30pm warming up your Friday night with the smooth tropical sounds of DJ LUCAS DATT, (San Paulo - now playing regularly at Ipanema bar on Ponsonby road), and the irresistible tropical bass party mix from DJ LICORICA (Waiheke, Prana, Sundaise). - $12 Cocktail specials during cruise. Dress elegant tropical but don’t forget a warm coat for out on the decks while you are soaking up the Auckland city lights at night. Fully Licensed Bar onboard open throughout the cruise serving a good array of New Zealand wines, beers and spirits. We accept eftpos, master card, visa and cash. Limited tickets – early bird special – don’t miss out! Waiting point: 30 mins prior to departure, Eastern Viaduct Gate @ old draw bridge by the vessel “Olympic Spirit”. Note: we cannot let you on the vessel any earlier! Note: We provide beverages on the vessel, so no BYO. Smoking permitted ONLY ON OUR OUTTER BOW area please where ash trays will be provided.